Audi A4 Saloon Performance, Engine, Ride, Handling | What Car? All the petrol engines are 2.0 litres in capacity and use turbochargers to boost power. The range kicks off with the 148bhp 35 TFSI, which we’re yet to try. Next up is the 187bhp 40 TFSI, which offers a considerable performance boost without pushing up running costs too much. 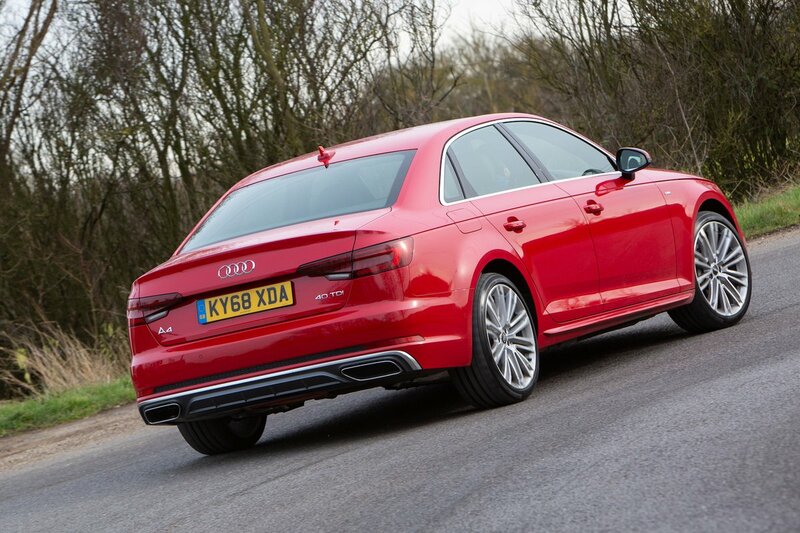 There’s also a 245bhp 45 TFSI that comes with quattro four-wheel drive and an automatic gearbox. As you might expect, it feels pretty rapid. However, it’s the diesels that we think make the most sense thanks to their better blend of pace and fuel efficiency. The 148bhp 2.0-litre (35 TDI) engine has decent low-end shove for driving around town but can feel a little flat if you’re overtaking on faster roads. This is less the case with the 187bhp 2.0-litre engine (40 TDI), which is our pick. At the top of the tree is the 282bhp 50 TDI. It's a revised version of the pre-facelift 3.0-litre V6 diesel, and if its predecessor is anything to go by, it promises rapid performance; we'll let you know once we've sampled it. Adding the quattro four-wheel drive (standard on the V6 model) improves acceleration at low speeds by helping the engine put its power to the road more easily, especially in slippery conditions. Specifying an automatic instead of a manual gearbox has no detrimental effect on performance and even improves it on some variants. The A4 is available with no fewer than three suspension set-ups: Comfort Dynamic, Sport and Adaptive Sport, not all of which are available on every model. That makes things a little convoluted, but we’ll try to break it down as simply as possible. SE and Sport trims come with our favourite Comfort Dynamic set-up as standard. This passive system uses conventional springs and dampers and will give you the smoothest-riding A4 if you stick with the default 17in or 18in alloy wheels. As its name suggests, this set-up puts comfort first, dealing effectively with all manner of lumps and bumps, while controlling body movements over dips and crests extremely well. It pays to remember that larger wheels tend to make the ride harsher. Pricier S line and Black Edition versions come with passive Sport suspension as standard. A stiffened and lowered version of the set-up above, it further sharpens body control but at the expense of a little extra bumpiness at low speeds. In our opinion that penalty isn’t worth paying, so take advantage of Audi's offer of a no-cost option to swap this stiffer suspension to our preferred Comfort Dynamic set-up. On S line and Black Edition trims you can pay a bit extra for electronically controlled Adaptive Sport suspension. It, too, is lower and stiffer, but being an adaptive system means you can press a button to soften things a little and enjoy a much smoother ride. If you must commit to big wheels for a racy look, it’s an option we’d recommend. Fun handling isn't necessarily a priority for executive saloon buyers, but if you want something entertaining to drive you’d be better off with a BMW 3 Series or Jaguar XE. Both these rear-wheel-drive rivals are more enjoyable for a spirited blast along a country road. 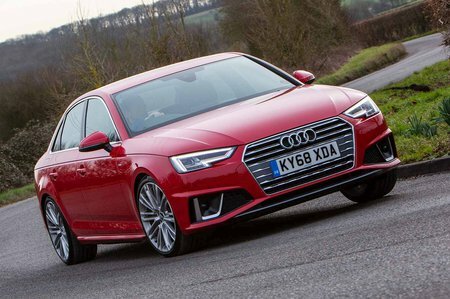 Rather than serving up raw thrills, the A4 handles predictably and securely, and grips the road exceptionally well. Versions equipped with stiffer Sport suspension feel the most nimble (see the 'ride comfort' section above for a rundown of the A4’s suspension options), remaining pretty flat through corners and changing direction with reasonable eagerness. However, despite a little added body lean, we’d stick with the softer Comfort Dynamic suspension that’s standard on SE and Sport; it provides a better balance between ride and handling. 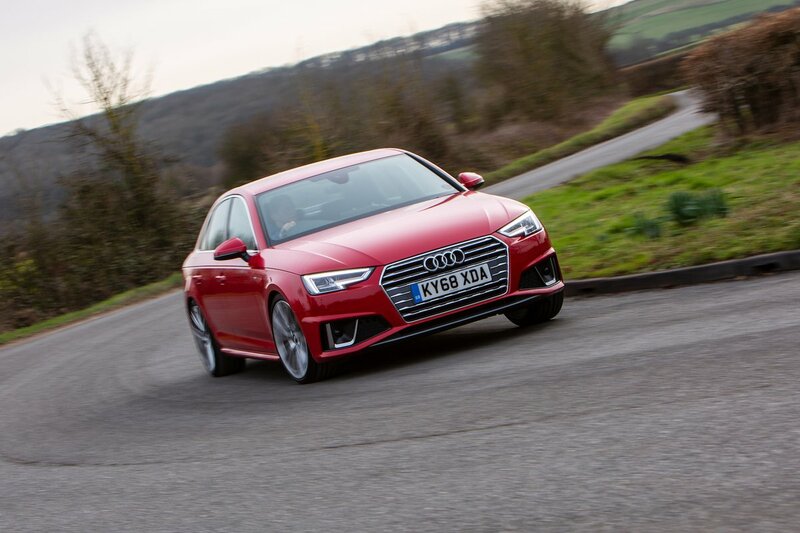 Front-wheel-drive versions tend to struggle for traction out of slow corners when the road is wet, but four-wheel-drive models, which are branded 'quattro', are pretty much unflappable. The standard steering is precise and weights up consistently as you turn in to bends, but it doesn’t give you a huge amount of feedback through the wheel. The optional Dynamic Steering benefits from a variable ratio, which means that you don’t need to turn the wheel as much to get around tight corners at low speeds. This is a pricey extra, though, and isn’t worth adding. This is one of the Audi A4’s strongest suits: all its engines, even the diesels, are hushed and transmit barely any vibration through into the cabin. Although we're yet to try the updated 3.0 V6 diesel (50 TDI), our experience of the previous version suggests that it should still be the most impressive of all. It's an engine that has proved as refined as those of luxury limos costing twice the price, remaining whisper-quiet even when worked hard. Watch this space to see if the latest version is still as impressive. The A4 suppresses wind noise better than its key rivals, too, and even over rough patches of road you’ll only hear the occasional muted thud from the suspension. Road noise is also very well suppressed — unless you add the bigger wheels, which have the potential to generate a lot more tyre roar. The six-speed manual gearbox is precise, light and easy to use. The S tronic automatic gearbox can be a little jerky at parking speeds, but it shifts smoothly the rest of the time. The brakes are also progressive, making it easy to shed excess speed smoothly.